State of being. State of mind. 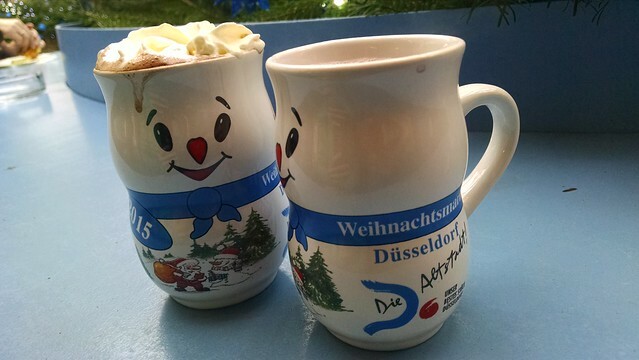 I decided to go to Christmas markets in Dusseldorf and Bath. I wondered if Christmas outside America was equally a commercial affair out to get people to buy stuff. Everything is so global it can be hard to tell, as American Christmas music blasted out in Germany. I did realize how many of our traditions are probably from German or English traditions. After buying a few ornaments and handmade presents for family and friends I moved on to the most interesting part of the markets for me, all the food. The first night involved train station market potato pancakes and mulled wine before heading off to a local brewery.Brauerei Schumacher, what a spelling, releases their extra rich latzenbier three times a year that used to be reserved for monks and the wealthy. We accidentally showed up on the right day to try it. 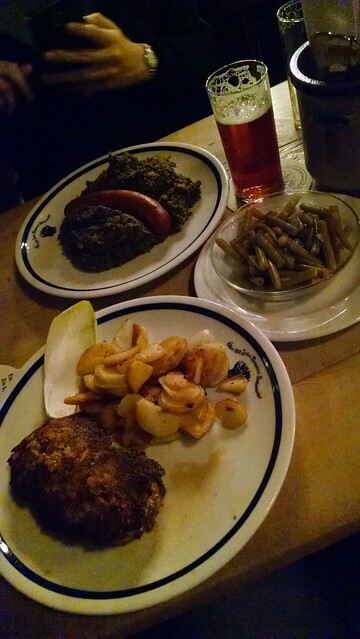 An excellent place to dive into the big meaty portions I associate with traditional German food. 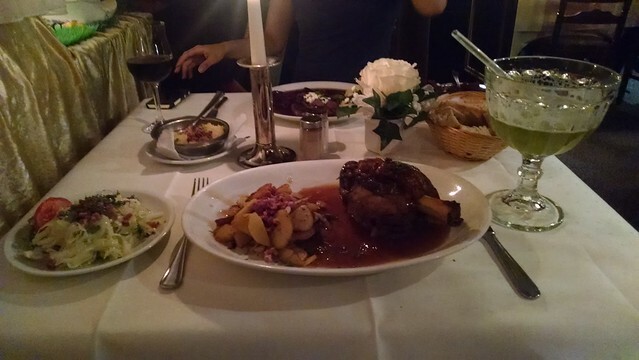 I saved the schweinshaxe for a later meal on this trip. 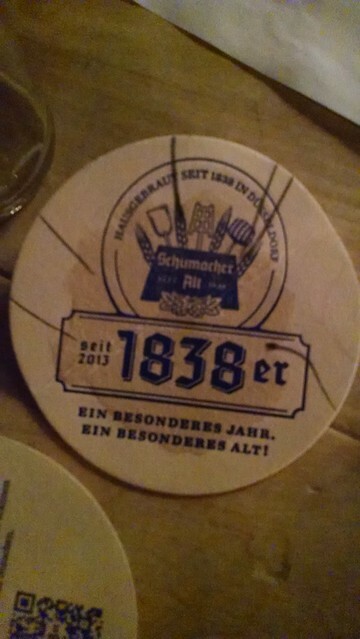 They mark the number of beers on your coaster, the big Russian dude next to us had 18 marks when he left. As far as I can tell, Christmas markets are as full of bars as the are stalls for anything else. This meant a lot of hot chocolate, spiced cider and mulled wine to warm us up. A whole wheel of deep fried camembert and forest mushrooms with a remoulade type cream dipping sauce from the same stall. Two of my favorite things at one stall, be still my now artery clogged but excitedly beating heart. Mettwurst! Now to find an excuse to make a mett hedgehog. 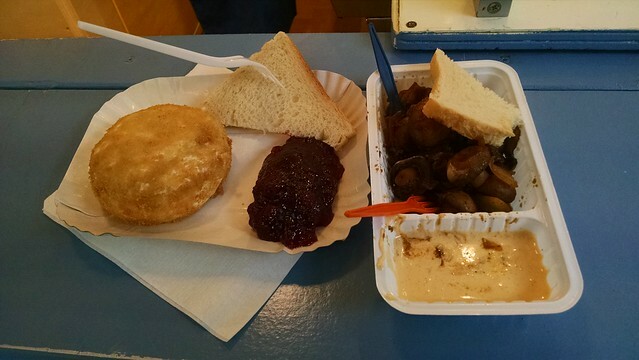 Ok this was the local market and not the Christmas market but I finally got my mettwurst sandwich and ate half before remembering to take a picture. 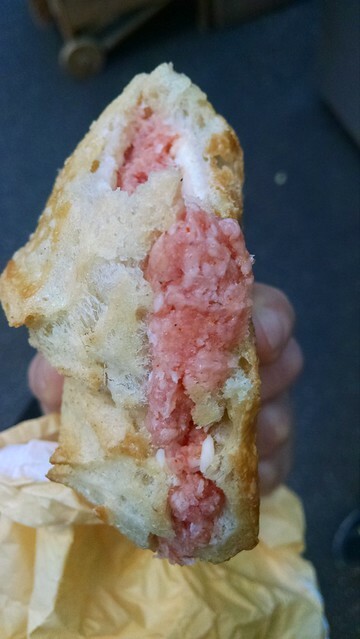 A friend in Berlin originally suggested it at 5 pm at a market that had it premade or from the supermarket. Even I have limits for raw meat. This one came from gesturing wildly at the very crowded butcher who had me walk across the aisle to the butcher before returning. Many thanks to the people next to me who helped me translate. At one point I wandered off the very ornately designed tourist markets that they put on a nice map for you into a random local market. Gone were the hand carved wooden everything replaced by mass market produced cell phone covers and plastic toys. It felt like a street full of mall kiosks. The potato pancakes and bars were still there. While I’m usually sick of Christmas music and commercial decoration it was fun to check out all the different variety of Christmas markets. How could I pass up a misconception about JFK proclaiming himself to be a doughnut? 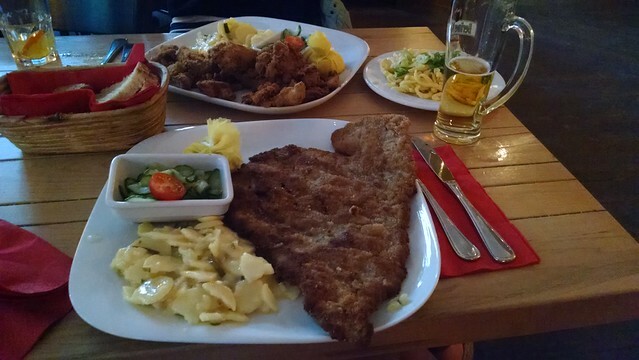 Alas, I don’t have many photos of Berlin so it will look like I ate a lot, perhaps not untrue either. It was also full of wonderful bicycle rides as we visited a friend who lived here. Seeing a place with a friend is mildly different than the general wander that I do. I enjoy seeing the place through their lens as a local and wonder what I would’ve seen myself. My friend did decline coming to the currywurst museum with me. I do wish I had gotten some pictures as Tempelhofer park seemed to be full of every type of possible strange human conveyance, but it’s hard to capture a guy racing by on a wind skateboard unicycle. Why, it wouldn’t be German to me without a schweinaxe and woodsorrel beer. The East German crosswalk symbol has his own snack food and store dedicated to his iconic look. 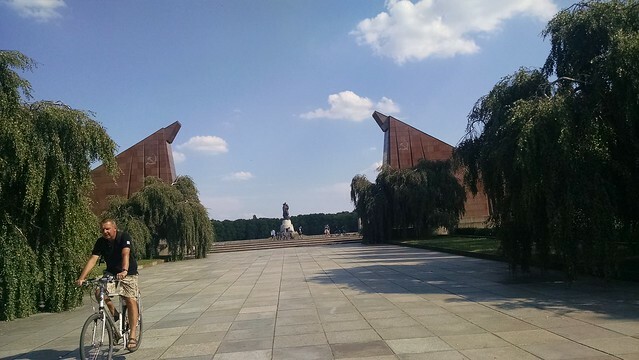 Communist parks and abandoned amusement parks made for great bicycle rides. 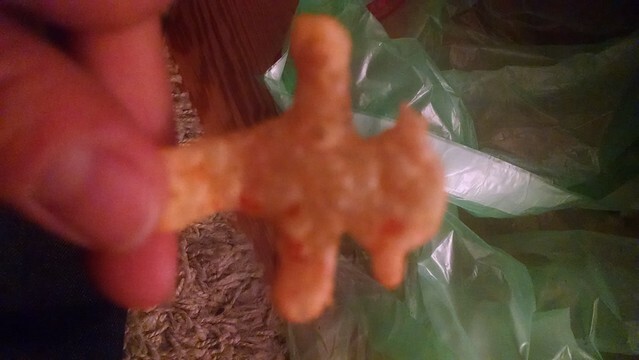 More pork and beer, this time fried. Well, not the beer. 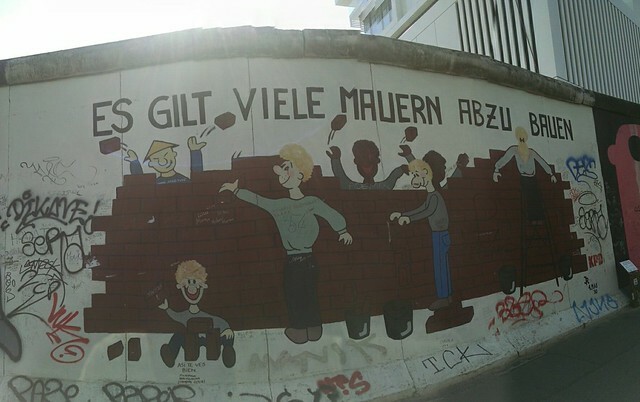 An old chunk of Berlin wall showing the city’s diversity?